We all wonder if Trump’s trade actions are as random as they appear or if there is a broader strategy. Some of my contacts argue that the relatively strong US economy allows the administration to take a harder line than would normally be advisable. We can ride out a trade war better than China can, the thinking goes. This only works if the US economy keeps prospering long enough for the tariffs to make China bend. We can postpone a recession for another year or two if the trade war doesn’t intensify and Europe holds together. But it is intensifying, so we may not get that time. In other words, tariffs could end the conditions that justified them. Like today, the Roaring 1920s saw rapid technological change driven by cars and electricity. This created a farm surplus as fewer horses consumed less feed. Prices fell and farmers complained of foreign competition. Herbert Hoover promised higher tariffs in his 1928 presidential campaign. He won, and the House passed a tariff bill in May 1929. The Senate was still debating its version of the bill when the stock market crashed in October 1929. Today, we use that event to mark the Great Depression’s beginning. But at the time, people didn’t know they were in a depression or even a recession. Most economists expected a quick recovery. Stocks did recover quite a bit in the following months, though not back to their prior highs. So, when the Senate finally passed a tariff bill in March 1930, the thinking was not that different than we see today. They thought they could preserve and even extend the good times. 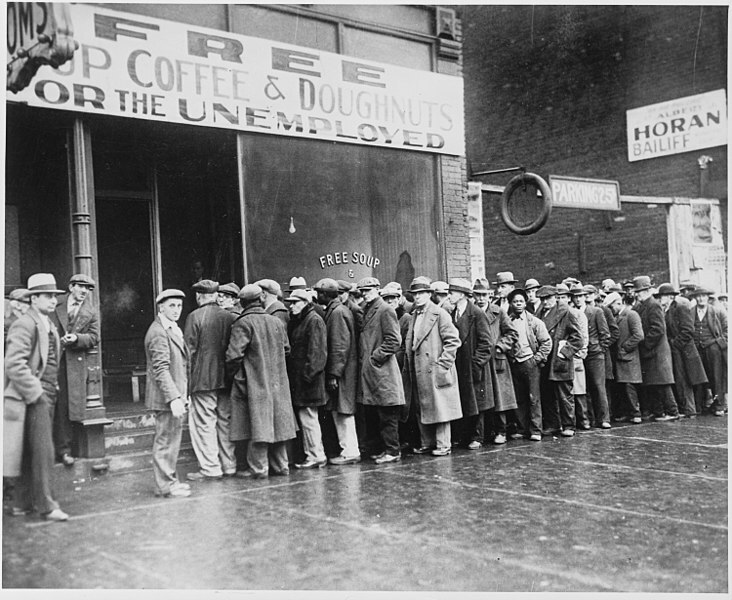 But conditions worsened quickly, and by 1931, unemployed men were standing in soup lines. In 1932, both Smoot and Hawley lost their seats as Franklin Roosevelt beat Hoover in a landslide—57% of the popular vote. That history won’t necessarily repeat this time, but it’s surely not a good sign. John Nash (one of the world’s great mathematicians, Nobel laureate, and centerpiece of the brilliant movie A Beautiful Mind) developed multiplayer game theory. Essentially, an equilibrium develops around the rules as they are at the moment. If somebody changes the rules, no matter how rational it may be, it makes everybody else change their response. Trump’s actions, especially in regard to China, may be perfectly rational. China is not playing fairly. But his actions change the rules and everybody else is forced to react. Throw in NAFTA, Europe, and all the other trade negotiations, and things get complicated. Yes, we have a new trade deal with Korea. The US is marginally better off. Trump is trying to do a one-off trade deal with Japan. Abe is cautious because Trump wants to open up Japan’s markets to US agriculture. We pulled out of the Trans Pacific Partnership (TPP) because it had flaws—clearly. But it served the purpose of isolating China. Trying to do bilateral trade agreements with every one of those partners is going to be very difficult and time-consuming, if not impossible. And so, everybody reacts to try to change the circumstances to their own benefit. This is multiplayer game theory on a scale so vast that it is almost impossible for the average voter to understand. And so, they get angry and say we need more tariffs to protect America. Just like every other voter in every other country is trying to figure out how to protect their markets. Free and fair trade is not what we have, nor have ever had. But trade isn’t a binary condition. Today, we see near-total isolation on one extreme (think North Korea) or at the other end extensive trade freedom within the European Union. There’s lots of room in between. China cheats in many and various ways. I’m not happy with the status quo, and I want to change it. The question is, are tariffs the best way to accomplish this? A second question is, even if tariffs accomplish the goal, will there be side effects that reduce or eliminate the benefits? I see a lot of unintended consequences. A few weeks ago, I described how a sandpile can slowly grow in size, apparently stable. But in reality, it has many hidden fingers of instability. At any moment, something could trigger an avalanche. The global trade system is something like that. Of course, it’s not perfect or even optimal. Countries erect barriers to their advantage. I can point to several countries whose economic policies are mercantilist, but at least everyone knows about them. We see the fingers of instability and leave them alone, lest we trigger an avalanche whose victims are impossible to predict. It is a kind of equilibrium. Everyone’s incentive is to avoid catastrophe and make incremental improvements. That makes trade talks extraordinarily difficult. The Trump administration doesn’t seem to care about equilibrium. Their strategy appears to be “kick apart the sandpile and make everybody rebuild it.” And whether we like it or not, many of Trump supporters actually like the concept of throwing a wrench into the system. So, it is not the case that the US has no choices. We have many choices. Tariffs are the wrong one. But then, that is just me and I am one lone voice and vote.